Toyota's new series of Electric Walkie Stackers is comprised of seven models, including straddle, counterbalanced and reach stackers with capacities ranging from 2,000 to 4,000 pounds. 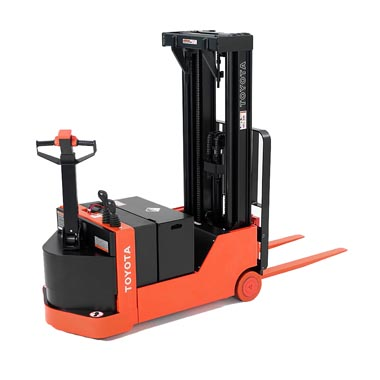 These versatile and easy to use forklifts are ideally suited for a variety of pedestrian truck applications, from manufacturing environments and retail store operations to general transportation and product distribution. Multi-function Control Handle with Large Dual Thumb Wheels, lift, lower and horn buttons allow easy activation of all controls with either hand. Hand Grips are designed at an 8.5º angle to fit the operator's natural hand position comfortably, reducing fatigue. High Visibility Mast with wide channels provides the operator with a clear view of the fork tips and a wider work area for increased load handling confidence and efficiency. Engineered with Metal Oxide Semiconductor Field Effect Transistor (MOSFET) Controller and Separately Excited drive Motor (SEM) Technologies resulting in improved battery efficiency, stepless acceleration and smooth operator control. Fully Programmable Drive System, offers precise control of the truck and reduces product damage. Spring-Loaded Torsion Bar Suspension, with automatic load-sensing adjustment and stabilizing casters, provides optimum loading on the drive tire to reduce steering effort and provide proper braking traction (6BWC & 6BWR). Contoured Manual Lift/Lower Control Levers allow precise pallet placement. The Electric Lift/Lower Controls in the Handle are equipped with a pressure-compensated valve for consistent lowering in all conditions. Steel Access Door provides convenient, tool-free access to all major components for inspection and maintenance. Routine Service Requirements are reduced and battery efficiency is improved with the MOSFET control system, because no contactors are used to control the SEM drive motor. Transistor Controller allows complete diagnostics with the use of a hand-held analyzer. 24 volt Electrical System provides greater performance and longer work cycles compared to some competitive 12 volt systems. UL-Approved Model Type E to meet specific environmental conditions. Electrical, Hydraulic and Mechanical Components are protected by one fully-hinged steel service door for less internal damage. Entire Powertrain is enclosed and operates in an oil bath ensuring long life. Transmission is a Heavy Duty Helical Spur Gear type that ensures a long trouble-free life and lower noise.